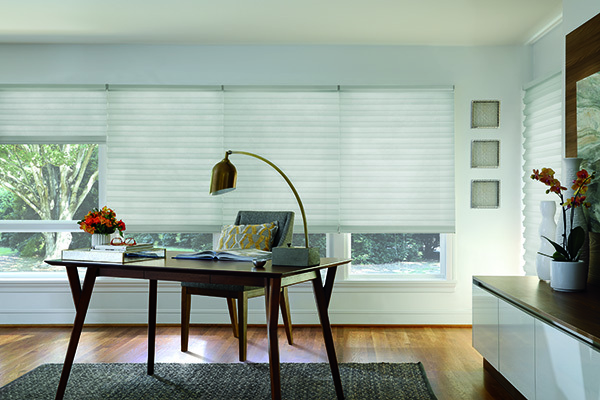 Genesis® has evolved to include roman shades to provide you exceptional light control with functional flair. 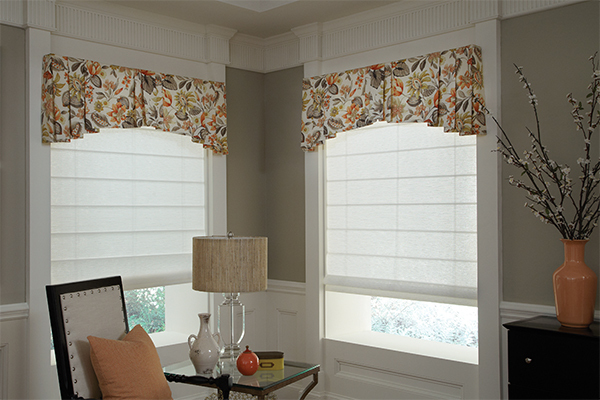 Lafayette's TLC™ child safe cord sleeve system is standard for all roman shades made by Lafayette Interior Fashions. For additional child safety, the Lafayette CareRING cordless lifting system is recommended for families with young children. Window dressings are central to a room's character and draperies add to its charm. Custom draperies can be made to be pleated, puddled, tied, or even all three at once. Instead of pleats, opt for grommets, button holes or tabs. The design options are endless with over twenty drapery styles offered and custom options such as decorative trim, pleat style or banding. Due to the wide range of styles and options, product specifications vary by the product type and options selected. Please contact a Window Wares, Inc. representative for specifications of these truly custom products. 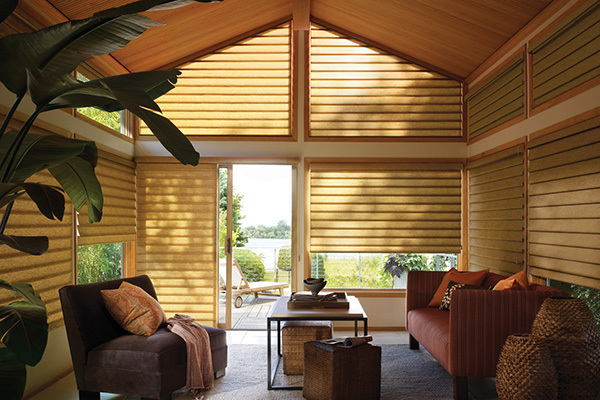 Graber Roman Shades allow you to add volume and soft folds of exquisite fabrics to any room. With so many fabric and style options, you’ll take your space from just so-so to sensational — simply by incorporating your personal flair. Our Artisan custom fabric Roman shades bring any room to life. Choose a classic flat style for a look that’s clean and chic, or select richly folded waterfalls to add graceful dimension. Other designs include looped Roman, seamless Roman, pleated Roman, and balloon styles. Whatever your desire, Artisan fabric Roman shades will intensify the elegance of your home. Fresco® Roman shades combine the softness of drapery with the practicality of a shade. Available in select fabrics and featuring a seamless, longer pleat size, the Fresco Roman shade delivers a sleek, modern look, so you can style your windows with confidence. Roman Shades - Chevron Collection, (Mushroom 3422), Options Shown: Fabric Shades in Classic Flat Style with Cordless Front Control Lift and Valance: Chevron, Mushroom 3422 with Globe Fringe Trim: Toffee 4296. Roman Shades - Madrid Collection (Azure 3515), Options Shown: Fresco Roman Shade in Flat Style with Cordless Lift and Valance: Madrid, Azure 3515. Roman Shades - Ainslie Collection (Arctic 5360), Options Shown: Fabric Shades in Relaxed Roman Style with Cordless Front Control Lift and Valance with Trim: Ainslie, Arctic 5360 and 1" Teardrop Bead Valance Trim: White 205. 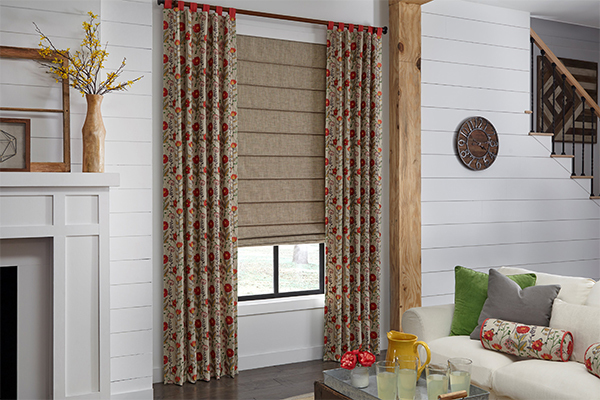 Roman Shades - Columbiana Collection (Inkwell 6870), Options Shown: Fabric Shades in Seamless Style with Cordless Back Control Lift: Columbiana, Inkwell 6870 with Edge Banding: Brunswick, Nomad 6601. Roman Shades - Regal Collection (Platinum 3237), Options Shown: Fresco Roman Shade in Flat Style with Cordless Lift and Valance: Regal, Platinum 3237. 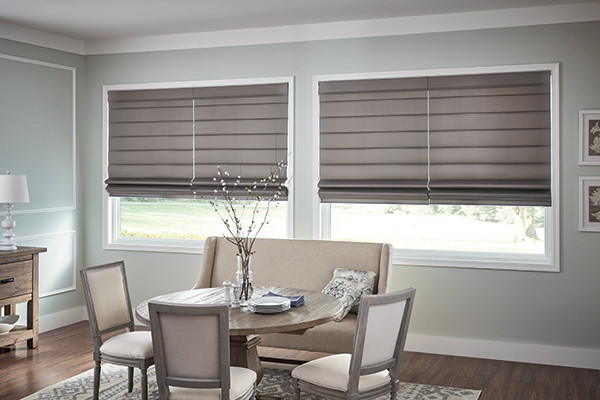 Roman Shades - Colfax Collection (Capri 1900), Options Shown: Fabric Shades in Seamless Roman Style with Back Control and Blackout Liner: Colfax, Capri 1900. Roman Shades/Natural Shades - Saterra Collection (Cocoa 6297), Options Shown: Standard Roman Style Natural Shade with Room-Darkening Liner in Cocoa 6297, Cordless Lift, and Premier 6" Valance: Saterra, Azure 03269.